The picture pretty much says it all, but the coolest part about the Lifebook N7010 is the 4-inch, 480x272 pixel touchscreen integrated into the keyboard area. Its most notable function is that it works as an app launcher, but according to Fujitsu's Paul Moore, you can use it as a second (really small) screen, with the ability to drag whatever you want down to the second screen like any other external monitor. Aside from the app launcher, it's intended to be used as a CD/DVD control panel, or as a photo viewer. Secondary screen aside, the N7010 happens to be a full featured laptop with a 2.26 GHz Core 2 Duo Processor, 16-inch 16:9 LCD, Blu-ray ROM drive, HDMI-out and a trackpad that supports multitouch gestures. 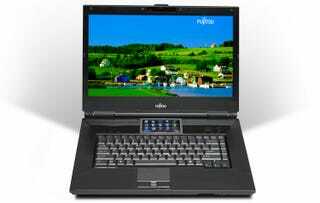 Other specs include up to 4GB RAM, 256 MB ATI HD 3470 video card, SD card reader, 1.3 MP Camera, eSATA port, Bluetooth and 802.11N wi-fi. Battery life is rated around 2.5 hours and hard drives come as big as 320 GB.